Children are wannabe survivalists. I noticed this during my five years as a teacher: I realized a tale of wilderness survival had the power to transform even history into a hot subject. For some stories, the appeal was obvious. I mean, the Donner Party? Of course. Everyone likes cannibalism. But even the mundane mechanics of survival got them going. If I could turn a math lesson into a game involving budgeting, it'd be an instant hit. I could relate. My own childhood was colored by a deep devotion to "The Oregon Trail," a ubiquitous computer game in 1980s classrooms. I believe an edition of "The Oregon Trail" is now available as an iPhone app, but I'm sure it bears little resemblance to the game I remember from my childhood. In the fifth grade, we lived for computer time, which consisted of playing "The Oregon Trail" on buzzing putty-colored monitors. The graphics weren't much: A tiny pixilated covered wagon crawled across a black background. The fun part was buying supplies for the trail. You had a set budget and you got to make the decisions. "Which do I need more -- a kerosene lantern or a 50-pound bag of beef jerky?" I'd muse with a seriousness I normally reserved for selecting candy at our local general store. But my appreciation for "Oregon Trail" didn't hold a candle to my love for books about survivalists. I liked stories about kids making it on their own. It wasn't just wilderness survival: I also loved stories about kids using their wits (and fabulous talent for budgeting) to survive in urban settings. The kid could be struggling on a remote island ("Island of the Blue Dolphins") or in the Metropolitan Museum of Art ("From the Mixed-Up Files of Mrs. Basil E. Frankweiler"). It didn't matter to me, as long as survival was laborious. I saw nothing romantic in my parents toiling to put food on the table, but my idea of fun was to read an incredibly detailed description of a wayward 10-year-old making syrup from the roots of licorice ferns. I probably read "My Side of the Mountain" 20 times. Published in 1959, "My Side of the Mountain" is the story of a 13-year-old boy named Sam who runs away from home, basically just for the hell of it, and sets up house in a hollow tree in the Catskill Mountains. The book contains remarkably detailed descriptions of Sam's survival techniques: He learns to make his own fishhooks, he trains a falcon to hunt for him, and he cooks pancakes made of ground acorns. As a kid I made salads with miner's lettuce and ate blackberries by the bucketful, but foraging for food was never an essential part of our survival as a family. Today it is. Throughout the financial ups and downs of this past winter, my husband, Rich, and I have relied on foraged food to add variety and nutrients to our diet. It may not seem like a big money saver to eat nettles instead of spending $2 on a bunch of greens at the store, but it adds up over time. When you have only $50 to your name, every dollar counts. I've found that I can actually avoid going to the store for weeks if I buy eggs from our neighbor, stock up on bulk food (I feel very "Oregon Trail" ordering 50 pounds of flour), and forage for our mushrooms and greens. Granted, we eat a lot of nettles. I try to keep things interesting by changing it up: We've eaten sautéed nettles, nettle risotto, nettle alfredo, nettle miso soup, nettle chanterelle omelets, nettle chanterelle quiche, nettle and chicken pot pie, Indian-style creamed nettles and nettle fritters. I would never subject myself to this level of financial deprivation just for fun, but as I spend yet another 20 minutes of my life climbing through dead blackberries to get to an untouched patch of nettles, I am grateful that I've found this sort of thing entertaining since Day One. Foraging adds an element of surprise to the day: What I find, or don't find, shapes what I cook. We live in the Oregon coast range, and as the sun finally punctuates the grim monotony of rain shrouded days, I'm getting excited for the cornucopia of new ingredients that'll be emerging. I've been checking prime oyster mushroom spots in the woods every few days, and I think of the boy Sam as I climb the hill behind our house. As I push my way through Oregon grape and sword fern, morning sunlight casts prisms of light in the dense forest. I pass through a stand of fledgling alders, no tree thicker than a child's wrist. I'm looking for the other end of the life cycle: When alders grow old and fall, oyster mushrooms sprout from the decaying logs. If you're lucky, that is. I find a few likely logs but no mushrooms, and I return empty-handed, save for a handful of miner's lettuce and an excellent antler I find lodged in the mud of an elk trail. 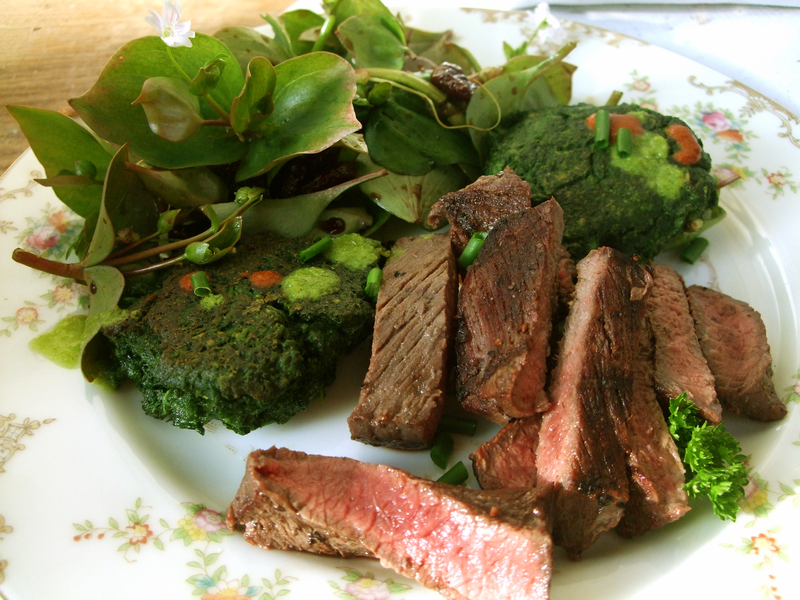 With "My Side of the Mountain" and my rather empty refrigerator in mind, I decide to serve the local elk with other locally foraged dishes: nettle fritters and a salad of miner's lettuce, mint and thimbleberry shoots. It's not a political statement so much as an enjoyable and inexpensive experiment. As the day progresses, I take a few minutes here and there to gather food for the meal. I pick nettles at the bottom of the driveway (getting stung on the thumb, in spite of my gloves) and save thimbleberry shoots as I weed my overgrown garden. Thimbleberry, or Rubus parviflorus, is a native shrub with fuzzy maple-shaped leaves. In summer the bush produces tasty red berries, but according to "Plants of the Pacific Northwest Coast" the Northwest coastal tribes also ate the tender young shoots. I grew up in this region and thimbleberries are everywhere, but this is the first I've heard that the shoots are edible. There's a first time for everything, though. The shoot snaps off easily. When I peel back the outer skin and bite, it has the crunch of celery. The flavor is mild and pleasant with the faint promise of berries. I put the shoots in a mason jar of water while I work on the meal's more substantial elements. After a splash of red wine, the elk backstrap is ready for its rub. I employ the old standards: salt, pepper and a little chile powder. While it sits for an hour, I make salad and contemplate my plan of attack. Backstrap is low on fat, so I opt to cook the elk hot. I'm in luck -- for the first time this year, it's warm enough to cook outside. The elk hits the grill above white coals, sizzling the smell of meat into the sweet May air. I cook the meat for a minute or two on each side and remove the steaks from the grill to sit in their own juices while I work on the fritters. I've been playing with a fritter recipe sent to me by a reader. I don't have any bread crumbs, so I toast a stale hotdog bun. I double the recipe's salt, add fresh parsley and garlic chives from my herb garden and a teaspoon of chile powder. (OK, you're on to me. I'm inclined to add a teaspoon of chile powder to everything.) The nettles render the fritter dough a surreal green, reminiscent of St. Paddy's Day beer. I've been out of olive oil for almost a week now, which is a bit of a tragedy, but it turns out that nettle fritters are delicious fried in bacon grease. I suppose I shouldn't be surprised. A splash of Poblano hot sauce adds necessary tang. Parmesan cheese, dried cherries and the stale hotdog bun are the only major nonscavenged ingredients in this meal. By all rights, the stale hot dog bun should throw the whole thing off. It's not even a "good" stale hot dog bun -- it's full of preservatives and God knows what. But it seems to me that the bun actually adds to the fritters: The texture of the finished product seems to capture the fluffiness of the bun, made succulent with the addition of spices, greens and farm-fresh eggs. The crusty fried fritters are nicely balanced by the spring freshness of the miner's lettuce salad, which is sweet with thimbleberry shoots, balsamic and dried cherries. We eat out on the porch for the first time this spring. As the sun disappears over the ridge, casting blurred leaf shadows on our table, I am happy with my plate of food. The elk was free, and the rest of the meal (which is hardy enough to stand alone, really) cost me only $2 total, or $1 per person. As I spear a fritter, I know why kids like to read about survival. Survival is the oldest story, and survival is at the heart of every story. All literature, reduced, is a story of survival. Modern life offers the illusion that our survival is a matter of invisible assets or status, but in the end it's really this: having the luck and wherewithal to feed ourselves. In our hearts, we know it's true. Kids are attracted to the mechanics of survival for the same reason I enjoyed gathering and cooking this meal. Surviving, and surviving well, is the essence of satisfaction. I'm grateful not only for the gift of elk, but for the kindness of a stranger who thought to send me a recipe, and for the bounty of our yards and hills. Though our fridge may be empty, our plates are full. Look for thimbleberry shoots that are just starting to show leaves. Snap shoots off at base. Peel outer skin and discard skin and leaves. Add shoots to bowl full of miner's lettuce, mint and dried cherries.